In biblical times, a woman’s hair was considered her crowning glory. And today, though the era has certainly changed, we spend billions collectively to ensure that our coifs are cut and curled to perfection. It can be devastating, then, for a woman to lose her hair, and while we may associate hair loss to aging women or chemotherapy patients, those instances don’t account for every case. 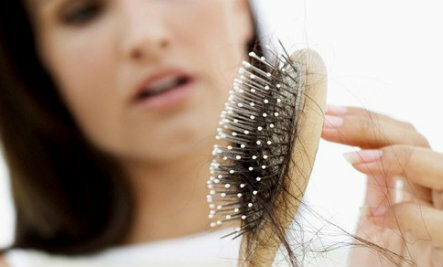 Hair loss can strike all women from all ethnicities and age groups. 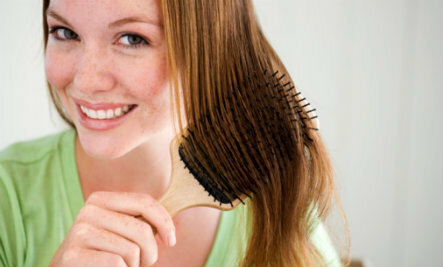 So if you’ve been noticing a few too many strands in your hairbrush lately, check this list of eight possible causes that may totally surprise you. To minimize hair loss while pregnant, Hamid encourages women to take prenatal vitamins regularly and to maintain a healthy immune system. Conversely, adds Hamid, an under-active thyroid can also put stress on the body, as nutrient overload and a lethargic lifestyle can impair hair growth. As if news of this genetic torture weren’t bad enough, Ellery also adds that female-pattern baldness is no longer exclusive to older women. “We live in a toxic world and have far more stresses and strains on women than in the past, such as work and family responsibilities,” she says. According to Ellery, TTM is often triggered in childhood and can be caused by a variety of stressors, from the death of a parent to losing a goldfish. Typically, people are unaware of their actions, but as time passes and a habit forms, they are no longer unable to resist the pulling. A behavioral analysis and psychotherapy are usually the best treatment. “Wearing your hair in the same type of style or ponytail repeatedly can lead to traction alopecia, which is hair loss caused by a pulling effect,” explains Ellery. This problem is often common with African American women who wear their hair in braids, or others with hair extensions. And while the urge may be to remedy the problem by discontinuing any handling of the hair, that actually has an opposite effect. “Often women stop to washing and/or combing or brushing their hair when they notice it getting finer, but that worsens the problem as hair needs to be clean and aerated to grow healthily,” Ellery adds. Recovering from something as serious as a car accident or death in the family is difficult enough emotionally, throw in the fact that it may also cause your hair to fall out and things get especially worrisome. Telegenic effluvium is the medical term for hair loss due to trauma or shock, and it can be triggered by anything from a heart attack or other major illness, to the simple birth of a baby. Officially, an autoimmune disease is any illness that develops when your immune system recognizes healthy cells as foreign invaders and begins to attack them. It is estimated that up to 50 million Americans suffer from some type of autoimmune disease – including celiac disease and psoriasis – and many can lead to hair loss. 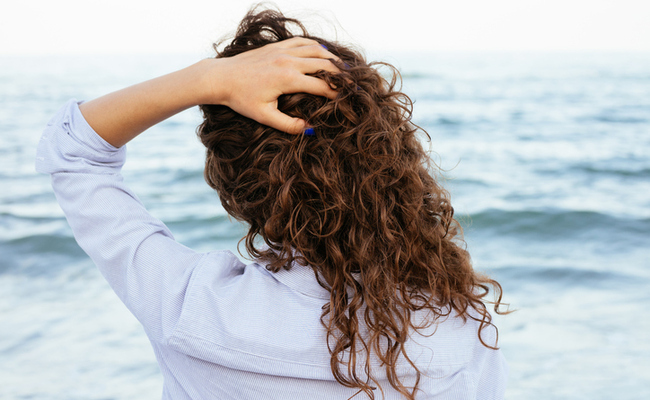 “Several processes fall under autoimmune hair loss,” says Frey. “Alopecia areas causes a patchy balding of the scalp hairs. There is no particular blood test, but thyroid dysfunction can be associated with it. Total hair loss of the scalp is called alopecia totalis, and total loss of body hair due to the same process is called alopecia universalis. There is no way to tell which form a person will develop but, fortunately, the latter two forms are fairly uncommon. “SpryLiving.com is an online resource for common sense health, wellness and lifestyle advice and inspiring, real-life success stories. Did you know that if you use the typical department or drug store brands of cosmetics daily, you could be absorbing nearly 5 pounds of chemicals into your body annually? Many of these widely distributed products that are highly advertised and hyped, including some of the ones your dermatologist sells, have been linked to deadly inflammatory conditions and even cancers. You might want to check your personal care product labels and see if they include any of the following: Mineral oil, sodium lauryl sulfate (SLS), petrolatum, propylene glycol, gycerin, collagen, elastin, hyaluronic acid, alpha hydroxy acids (AHA’s), bentonite, fragrances, kaolin, lanolin, lauramide DEA, sodium chloride, or benzophenone. These are the culprits we don’t want to put on our skin, which is the largest organ in our bodies. Some of these ingredients are even advertising buzz words that we have become accustomed to believe that they are actually good to have in our products, but nothing could be further from the truth. To the get the “skinny” on each of these ingredients and why you don’t want to put them on your skin, please peruse, “The Truth About Cosmetics,” as we are going to learn how to avoid all of them by making some or all of our own personal care and beauty products both safely and cost effectively. I will share a few here but there is a wealth to be mined online and you can experiment yourself with these recipes and find many good ones. Making our products ourselves is the very best way to be sure that we’re not ingesting or applying these and many more dangerous chemicals topically. In the spirit of DIY why not simply take matters in our own hands and make our own meals at home as much as possible and make our own beauty and personal care products, too? I think you will find that this can be both fun and easy to do when using your own organic and natural ingredients. You might even find that you may already have beauty-fuel ingredients right in your own kitchen that can be the base of many homemade personal care products. I suggest to my clients that the most important natural food and ingredient to have on hand to use as a base for our homemade personal care products is organic, expeller pressed, unrefined, virgin, coconut oil. Coconuts have been found to be extremely nutritious. They provide coconut meat (which we usually purchase as flakes), juice, milk, and oil which has fed, nourished and soothed populations, externally and internally around the world for hundreds of years. Many island nations use the coconut as a staple food in their diet because it provides the majority of the food the people eat. The idea I present here is to use it both internally and externally! Why Should We Use Coconut Oil Internally? Coconut is highly nutritious and rich in fiber, vitamins, and minerals. It is classified as a “functional food” because it provides many health benefits beyond its nutritional content. Coconut oil is of special interest here because it possesses healing properties far beyond that of any other dietary oil and is extensively used in traditional medicine among Asian and Pacific populations. 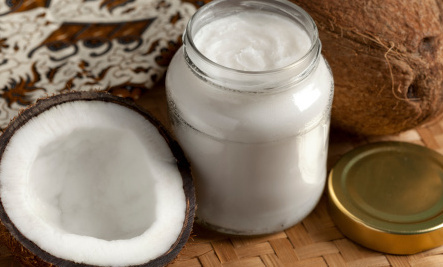 Pacific Islanders consider coconut oil to be the cure for all that ails them. I couple it for my clients with an organic cold extracted greenlip mussel oil supplement in capsule form, in order to augment the benefits of the coconut oil by incorporating the unique array of anti-inflammatory Omega-3 fatty acids which this marine source is rich in. See MoxxArt.com for more information about greenlip mussel oil and its synergistic potential for people and animals when combined with coconut oil. The beautiful, bountiful, coconut palm is highly valued by most island people as it is known to be both a source of food and medicine. It has been known as “The Tree of Life.” Modern medical science has recently unlocked the secrets to coconut’s amazing healing powers, according to the Coconut Research Center. Coconut oil topically acts as a wonderful moisturizer for all types of skin, including dry and aging skin. Coconut oil is a safe solution for preventing dryness and flaking of skin and it makes a perfect massage oil, as well. It is known to delay the onset of wrinkles, and sagging of skin which normally become prominent with age. Coconut oil also helps in treating various skin problems including psoriasis, dermatitis, eczema and other skin infections. Coconut oil should and does form the foundation ingredient of various personal care products such as soaps, lotions, and creams. Coconut oil also helps in preventing premature aging and degenerative diseases due to its antioxidant properties. The nutritional benefits of coconut oil are said to include hair care, skin care, stress relief, maintaining healthy cholesterol levels, weight loss, increased immunity, proper digestion and metabolism, relief from kidney problems, heart diseases, high blood pressure, diabetes, HIV and cancer, dental care, and bone strength. These benefits can be attributed to the presence of lauric acid, capric acid and caprylic acid, and its properties such as antimicrobial, antioxidant, antifungal, antibacterial, soothing, etc. To use coconut oil in your daily routine, it’s as simple as applying pure coconut oil all over your body and then stepping into a steaming shower or tub. And then how about using a homemade coconut oil scrub to exfoliate your skin? Scrubs offer a fantastic opportunity to remove dead skin and make you feel invigorated in the process. For an all-natural moisturizer after bath or shower, pure coconut oil is my favorite. It’s a beauty-fuel moisturizer and a potent source of the beneficial fat lauric acid. I put a tablespoon in my herbal tea and sip this before, during or after my bath or shower. 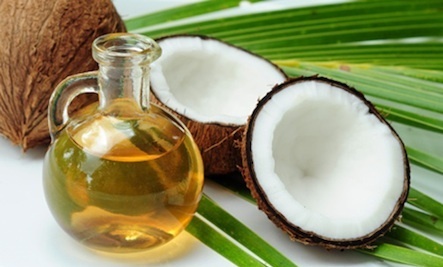 Your thyroid gland loves coconut oil as it helps to nourish it. One of the symptoms of hypothryroidism is dry skin so we get double the benefits when we use coconut oil internally and externally as often as possible. How Else Can We Use Coconut Oil? If you are using coconut oil for topical purposes, especially skin, scalp and hair care, just melt the oil (if it is in its solid state) by keeping the bottle in the sun or warming it in warm water. Coconut oil melts in hot weather and congeals in cold weather and this is normal for coconut oil. You can also take some coconut oil out and put it in a small bowl and heat the bowl over a flame (do not use microwave). Then take the oil on your palm and apply it to your skin, or scalp and hair. Body Lotion: After a bath or shower, just massage coconut oil all over your body— it feels and smells amazing. You can remove any excess oil with a Turkish towel and rub yourself down briskly. Facial Moisturizer: Whether your skin is dry or oily or even if you struggle with acne, coconut oil turns out to be antimicrobial, antifungal, and antibacterial, which explains why it heals skin conditions so well. Eye Makeup Remover: Just melt a little coconut oil in the palm of your hand and apply it to a cotton ball and remove your eye makeup gently, as you would with a store bought product. Don’t get any oil into your eyes, please. Hair Conditioner and De-Tangler: Coconut oil is great for all hair types, thin, thick, straight or curly—coconut oil helps amazingly and after blow drying or flat ironing apply a little to your hands and use to achieve a sheen. Deep Conditioner for Hair: Perhaps once a month or after coloring, perming, straightening or other treatment, slather coconut oil on your scalp and let it soak in for a little while and then shampoo out. Toothpaste: Baking soda + coconut oil makes a fine toothpaste. Simply mix 1/4 cup coconut milk (I use the Thai canned coconut milk but there are other options to experiment with or make your own) with 1/3 cup liquid castile soap (like Dr. Bronner’s) and combine with 1 tablespoon coconut oil, 1 teaspoon almond oil and 10 to 20 drops of essential oil of lavender or rose (stop after 10 drops and see how you like the fragrance and then add more slowly checking after each addition to customize your shampoo). Combine all ingredients in a blender or whisk thoroughly and pour into a recycled shampoo bottle or jar and shake well. Again you can recycle whatever you have on hand for this purpose. It’s great to repurpose whenever we can. Shampoo as you would with any shampoo and rinse well. A rinse of 50 percent water and 50 percent white vinegar is a nice finish. Or try a coconut oil hair mask. Combine all ingredients and using a wide tooth comb, comb it through your hair and cover with a shower cap or a wrap your head in a warm towel for about 30 minutes. Allow the Deep Coconut Oil Conditioner to penetrate deep into your hair and scalp, then rinse the conditioner out with tepid water. Shampoo with our homemade coconut oil shampoo and rinse. All of these homemade personal care products will last a bit longer and stay fresher (up to a week) if you keep them in the fridge! You can see by these examples that there are many personal care products that we can make ourselves by utilizing the beauty-fuel coconut and other natural ingredients. When we cook with and use coconut oil in many of our recipes, we make full use of the beauty-fuel benefits of the bounty that the coconut and nature itself offers us. This way we can achieve beauty that is more than skin deep! Celeste Yarnall, Ph.D is an author, lecturer and holistic practitioner. Through her company Celestial Pets, she consults with animal companions and specializes in the species specific, raw carnivore diet and EFT Tapping solutions. She is a medical intuitive, Reiki Master and author of 4 books. She and her husband, Nazim Nazim, a contemporary artist, live in Westlake Village, CA with their 4 cats! You can connect with Celeste on Facebook here.